If you live in the Northern hemisphere you’ve seen the last of the warm weather collections for 2009. Even as many of us fight through a heat wave, retail stores are about to stock up on Autumn and Winter merchandise. Absurd I know, but that’s the nature of the crazy retail cycle. You know the drill. YLF closes every retail season with a “best and worst”. Raves today, rants tomorrow. I would also like to hear your closing thoughts on the last six months of fashion. Superb recessionary pricing structure: In all my retail years, I’ve never seen a fashion season as heavily discounted as this one. So many bargains! Brilliant accessory selections: Accessories are the fasted and cheapest way to inject a bit of new into an existing wardrobe. Scarves, bracelets, belts, handbags, hose, headbands, watches, wallets, hats, pins, necklaces and earrings have been particularly strong this year. What a clever retail reaction to our tough economic climate. Delicious 80’s revival of fashion: Designers have taken inspiration from “the decade of anti-fashion” and made it killer. I’m blown away with how creatively and successfully the best of 80’s styling has been re-interpreted. Dresses and tunics: Stores have generally shown an excellent assortment if you were prepared to dry clean, hand wash and wear sleeveless. I’ve managed to do major frock and tunic shopping with clients this season, which is not the norm. Leggings: We’ve seen the best selection of leggings ever: zippered, studded, ruched, embossed and stirrup styles in all sorts of fabrications, colours and leg lengths. The perfect accessory to dresses and tunics and a totally fabulous look. Biker inspired styles: Tough edge fashion looks continue to trend and they are close to my heart. The huge assortment of both subtle and overt motorcycle detailing on all sorts of wardrobe items has been inspiring. Something for everyone. Boyfriend items: I’m not drawn to boyfriend jeans, but enjoyed boyfriend-inspired items like cardis, jackets, watches and shirts. I got a nostalgic kick out of the shoulder pad trend in boyfriend blazers and hope to find a version that works for me. Volume: Banded tops, sack dresses and cascading cardigans have been winning waist-less pieces. 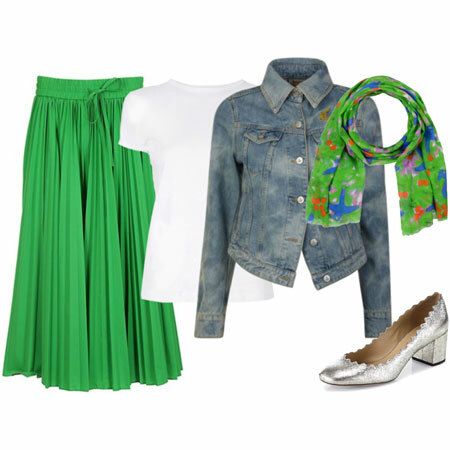 They are an excellent way to camouflage muffin top and add a fun, arty element to your look. Silver grey: This has been the season for grey. As popular as black and white, I’ve enjoyed seeing grey function as another versatile neutral. Sea of green, yellow and turquoise: It’s nice to see how this fresh Summer palette has been embraced by retailers and consumers. White items: Warm weather is about adding white items to ensembles. With the fab selection of white tops, jeans, dresses, skirts, shoes and accessories, it’s been easy to incorporate an instantly fresh Summery look into your style. Gladiators: The sandal of the season has been stellar, making it possible to refresh past season’s outfits with the addition of this single item. Even I managed to get a comfortable pair, which was a tall order. Colourful non-patent handbags: Loads of magnificent handbags in matte fabrications and interesting textural tones have made a welcome change to the sea of patent we’ve seen over the last three years. Deeper assortment of higher rise jeans: While there is still a shortage of fabulously fitting jeans with higher, girdling rises, stocks have improved. Let’s hope this trend gains momentum next season. Bring on the raves, ladies. I’m excited to hear your impressions. 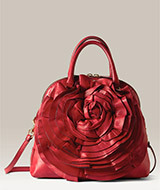 The house of Valentino came out with a collection of sculptured handbags that was second to none this season. Just for fun, here are my insanely unaffordable dream handbags that represent the very best of Spring and Summer 2009. Perhaps I’ll find them on eBay one day. I always love your Rants and Raves posts, Angie! I agree with your assessment, I have been able to add quite a few affordable trendy items to my warm weather wardrobe thanks to the lower price point a lot of retailers are instituting right now. Angie, those Valentino bags are a dream indeed. I saw them a few weeks ago and I had to ask my husband to hide my Amex while I gather my wits. I really enjoyed leggings and I am excited to wear them well into Fall. Pewter footwear was another discovery for me, again thanks to you, and I love it so much more than black. I really enjoyed mixing bright colors and neutrals, small print patterns especially mixing polka-dots with other geometric patterns. The gladiators were my favorite footwear during weekends. I finally felt skinny enough for the skinny jeans so I got a pair. Overall it was an exciting summer for me in terms of fashion, and big thanks go to you and all the forum members for inspiration. Wow Angie, those bags are spectacular! I agree with you pretty much on all the counts. I have started wearing leggings this summer an fit has been a life-saver with my significant weight loss. Silver grey and biker items are other favorites. I haven’t gotten my gladiators yet, but I am planning to pick up the Brulee’s even as the summer might be coming to an end. I always love when you this type of post! Lusting after those bags…actually Oliver Bonas (www.oliverbonas.com) in the UK has one similar to the one in the middle, but in beige and black and probably a fraction of the price. If it was red I would have bought it. I have had to stick to accessorising this summer due to budget constraints but have indulged in a couple of pairs of gladiators that I love. I confess I have yet to get a pair of leggings…there is still time I hope! I feel in love with those Valentino bags too. They made me stop in my tracks while I was walking through Norstroms. So absolutely GORGEOUS! I adore these roundups, and always agree with nearly everything you choose, Angie. 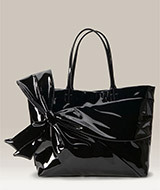 I was especially enamored of the liberal use of white this season, biker accents, and bright bags. What fun as always to read your list, Angie! Thanks to you, I added clams to my summer line-up and found them indispensible. Add in a lightweight cascading cardi and a JCrew ruffle tank, plus ballet flats or gladiators, and that was my summer uniform. Now, bring on fall! The season’s rant and rave is always one of my favorites and helps me focus on what I may still want to add. Thanks to you I’ve added leggings, a cascading cardi, pewter flats and KC Cedars, some silver grey and some tops with volume. I’m on the lookout for more tunics/dresses for leggings and skinnies that don’t over whelm, more silver grey, more turquoise, and a perfect cropped white denim waistcoat. Last summer there wasn’t much available in white denim and in long tops compared to this season. I am so, so glad I decided to try dresses at the same time as stores were flooded with them! They have completely changed my sense of style and my closet. I also managed to find many that work fine in the washer; my dry cleaning bill is a tenth of what it used to be. -boyfriend cardigans and boyfriend jeans. Two silhouettes I would never have tried in a million years, but they work with my new shape wonderfully! -banded tops. I would like to find more of these, but the right ones take some searching. -gold necklaces and hardware. I’m enjoying changing it up from my usual silver, and like both metals on me. Mmm I would *love* one of those handbags. Gorgeous. I am so happy I took the leggings leap. They have allowed me to wear dresses for the first time in my life! It seemed to me a couple of years ago the stores only held very young styles (very low rise, tight or midriff-baring) or very old, matronly styles. It seems right now there is a return to flattering clothing for all shapes. I see this in a lot of your list items, and I’ve been very glad about it, as evidenced by my AmEx bill. Always love these posts, what will she say tomorrow “rant” – can’t wait! But as for the raves – The lovely way gray has invaded my wardrobe, how did I get along without it – my favorite neutral. Leggings have also been my fave – no longer the flashdance look – but a cool way to wear dresses and tunics without showing everybody my *oops* when bending and leaning over. I’m also with you on the pewter footwear, love it so much I may never give them up. However, I did incorporated that into your most maligned “crocs” as well – got a great pewter gray pair! I’m sorry :^)) For me, in the costume shop, nothing works quite as well standing on that concrete floor cutting out fabric – they are saving my knees and ankles. Forgive me, Angie! With recession era pricing comes recession era incomes and [lack of] jobs, so unfortunately I haven’t been able to partake in any of this seasons trends. I guess it’s just as well since summer here is relatively short and I find more pleasure in shopping in the cold season. I am in agreement on your assessment of bests (except dresses since I do not dry clean and don’t like sleeveless). 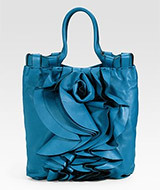 I love the ruffled handbags! I’ve been on the lookout for an affordable version since you first posted that red one. I saw this one in Real Simple magazine and ended up ordering it a few weeks ago. It’s bigger than my typical handbag, but I am still loving it! I ordered the Pewter one and I’ve been using it all week. For me the best thing this year has been an abundance of dresses that FIT ME. Oh my, the past two years have been quite difficult in that regard,but by some miracle this year I have found several dresses, including the ever difficult-to-fit sheath dress. The fall looks like it will bring more sheath dresses too, so hopefully this abundance will continue! You covered everything on the list. Loved my accessories (especially the white watch) over last six months. Grey has become my new neutral as well although I am still searching for perfect grey handbag. Those Valentino-like ruffles seem to be adorning items everywhere: at Gap on bottom of cardigans, at NY&CO on tshirts and tanks, etc. Lovely, feminine options to mix up with the boyfriend stuff. Recession pricing is causing my closet to overflow!! haha, I don’t think you approve of that Angie. I haven’t bought any dresses this year because I still have 4 nice everyday ones that I wear but not enough to justify more. I just bought my first leggings which is a look I’ve been wanting to try (I know I’m behind)! I haven’t seen a boyfriend item that really appealed to me but I bought 2 banded tops and a pair of white shorts. Gray has always been a staple in my wardrobe and a I bought a great silver gray top at the Limited this weekend! As Maya said, with recessions pricing comes recession incomes. I am thrilled to have just gotten a tiny clothing budget back after nearly a year of mandatory shopping ban, so I don’t have much to say about the past season. I have even tried to avoid YLF so I won’t be tempted to spend money I don’t have. I’ve only been shopping a few times this Spring, and that has been mostly window shopping. I have noticed the great prices, but they were still out of my $0 budget for clothes. 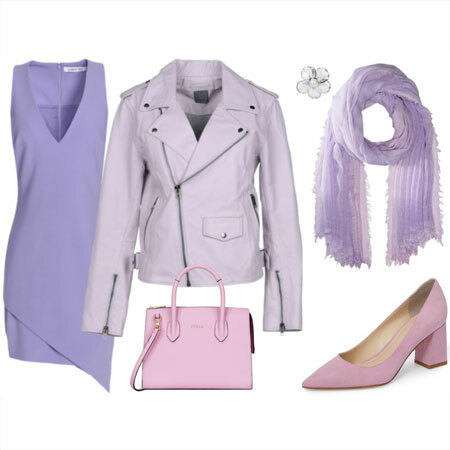 I did splurge on a few items, including 2 spring scarves from Express, which I love. Also, graduation money in May gave me a little to shop with. In general, I have continued to enjoy the 80’s revival and am curious how the 90’s will be reinterpreted next. My favorites have been dresses, tunics, leggings, skinnies, ruffles, maxi dresses, turquoise, silver grey, and wonderful white.